Heat Exchanger Blog — Radiant Design & Supply, Inc. The floor heating system we recommend is operated by a weather responsive outdoor reset control integrated into the boiler. These controls regulate the water temperature in the floor heating system according to the outdoor air temperature. This means of heating system control provides a regulated water temperature for the radiant floor that produces just enough heat to hold uniformly comfortable room temperatures without thermostat cycling. This method of control produces uniform radiant floor temperatures that change slowly and proportionally to changes in outdoor temperature. Outdoor temperature changes, including sudden temperature drops (blizzard), and temperature rises (Chinook), are automatically compensated for so the indoor temperature remains constant. The system is reliant on thermostats only for zone temperature limiting. More importantly, the heating water temperature is limited to the lowest temperature necessary to carry the actual heating load. This low temperature operation is the hallmark of efficiency for floor heating systems. High performance homes can be heated under design conditions with heating water temperatures that approach the desired room temperature. In addition to comfort, these low heating water temperatures also provide for the most efficient operation of any heat source employed, including condensing gas boilers and especially solar systems. Condensing boilers, like the Vitodens, are so called because they achieve very high 96%+ efficiencies through the extraction of the latent heat of the water vapor in the flue gases. However, in order to condense the vapor in the flue gas to liquid water it is necessary to operate the boiler heat exchanger at heating water temperatures that are below the dew point, i.e. less than 120 °F. The reset controller built into the Vitodens boiler controls the combustion and regulates the heating water temperature to the lowest possible to encourage this condensing operation. A feature of the Vitodens boiler is that it maintains very high combustion efficiencies with record low emissions, even at very low firing rates. It is partially this cold incoming water that makes domestic water heating typically the very best of solar thermal applications. Dedicated solar domestic water heating systems are able to do a great deal of useful work – and offset more conventional fuel - at these low load temperatures. For this reason, it is vitally important that solar system designs specifically prioritize the collector array to address this low temperature load in isolation from other heat sources. If a backup heat source is allowed to provide the required domestic water temperature lift directly and immediately, then the utility of the solar system in heating domestic hot water essentially falls to zero. Simply put, if the water is already heated by using the backup fuel, then the job has been done. Conventional dedicated solar water heating systems typically dedicate a storage tank to the solar system to isolate the incoming cold water from the backup heat source so that as much as possible of the temperature lift needed to produce use temperature is provided by the solar system alone. A dedicated solar domestic water heating system provides much of its energy savings by pre-heating the incoming water to a higher temperature before a back up heater is employed to raise the water to use temperature. The design with negative consequences we have seen shows a storage tank that is fitted with a heat exchange coil in the bottom of the tank as well as a smaller tank, intended to hold the potable domestic water, suspended in the top of the tank. It is intended that the shell of the suspended tank serve as the sole heat exchange surface to provide heat to the domestic water from the larger tank. It’s also intended that the coil in the bottom of the larger tank be connected to the solar collectors. The design indicates that a condensing boiler is to heat the larger outer tank directly and use a pump to move heated water from the boiler into the larger tank. Another pump is shown that is intended to circulate heating system water through the larger tank to the space heating system. There are several immediately notable negative consequences to this design. - The domestic water is not isolated from the boiler as a heat source. In order to provide domestic hot water on demand at any time, it is necessary to operate the boiler in such a way as to hold the larger tank at temperatures above (for heat exchange purposes) the required domestic hot water delivery temperature. I project that this larger tank must be held in the 140° range to provide adequate domestic hot water delivery in the 120° - 130° range. - Because the boiler will be able to address incoming domestic cold water directly and immediately, there would be little or none of the domestic water heating load for the solar system to perform. - Unlike dedicated solar water heaters and other combination load solar heating designs, this system requires that heat be exchanged twice to domestic water, further isolating the solar system from the domestic water heating load. - As the boiler will be keeping the tank hot (minimum 130°- 140°) at all times, this will provide the temperature floor at which the solar system is allowed to operate. In order to do useful work, the solar collectors must reach a temperature 10° - 20° higher in order to operate. - The temperature range in which the boiler is holding the larger tank, (130° -140°) is sufficiently high as to inhibit high efficiency condensing operation of the boiler and may obviate the investment in a condensing boiler. - For both space and water heating, the efficient operation of the otherwise low mass, condensing, modulating boiler is greatly inhibited by the large tank of water. The design prevents the boiler from directly addressing either heating load. Instead the boiler must always overcome the thermal mass and associated heat losses of the large storage tank. Saddling either the back up domestic water heating system or the space heating system with this extra thermal mass is hugely counterproductive. It makes the system sluggish and unresponsive and decreases efficiency as a result of higher heat losses. - Without further adjustments to the temperature of the water used for space heating, the water temperature prevailing in the large storage tank will almost always be too hot for the weather conditions. This will especially be true as the solar system produces temperatures well above that necessary just to create domestic water. This will cause the radiant floors to short cycle and may create temperature swings in the space, especially under changing weather conditions. Very high water temperatures should be avoided altogether. - Because the boiler is firing the large storage tank to a minimum temperature setting necessary to maintain domestic water heating - and because the radiant floors are not being operated at the lowest possible water temperature for the conditions - neither the boiler nor the solar system will be able to address the space heating load at the lower temperatures that could be possible with other designs. - The design of the storage tank itself is an issue. Our experience with tank-in-tank designs such as this has not been good, and we know that there are better alternatives available. We have found that the heat exchange surface gives less than adequate response, which is reduced with inevitable fouling. These tanks cannot be completely drained as all of the piping comes in from the top. The heat exchangers cannot be cleaned, as there are no clean-out ports or openings common to other tank designs. The consequence of this is that if or when the tank fouls, it cannot be maintained but must be replaced. *The ability to do useful work at low temperatures is one of the several characteristics of dedicated solar domestic water heating systems that make them much more economically attractive than other solar applications, especially space heating. The solar controls simply compare the temperature of the solar collectors to the temperature of the solar heating load and only actuate the solar collection circulator if the solar collectors are sufficiently ‘hotter’ or at a higher temperature than the load. The solar controls also incorporate an ‘off differential’, which sets the minimum positive temperature differential at which the circulator should be allowed to operate. If the system is allowed to operate at a negative temperature differential, heat will be moved backwards from the heat storage tank and lost through the solar collectors. January 9, 2015 by Dale Pickard. Today we feature an interview with Amory Lovins, preeminent environmental thinker and co-founder of the Rocky Mountain Institute. With forty years of energy policy experience, Amory Lovins has dedicated himself to the idea that our energy future does not have to look like our energy past. Listen in as Arnie and Amory discuss transitioning towards a clean energy economy in the US and around the world. The images in this film were either taken by Nathaniel White-Joyal or were in the public domain. Tagged with Amory Lovins, Rocky Mountain Institute, energy policy, clean energy, economics, environment, climate change, global warming, fossil fuels, renewable energy, green technology, efficiency, energy conservation, energy efficiency, environmental design, power grid. October 10, 2013 by Dale Pickard. We commissioned our colleague Jon Shafer to help us with a simple infrared study of several different designs for heat transfer plates now on the market. Jon, owner of PowerHouse Integrated Conservation Solutions, is an accredited building energy auditor and experienced thermographer. We wanted to demonstrate the comparative heat transfer characteristics of the different designs under identical operating conditions. Our study consisted of placing five different samples of heat transfer plates on separate copper tubes that all carried the same water temperature (120° F) and same flow in each tube (1.25 gallons per minute). This relatively high flow rate through the relatively short copper tubes insured that each tube supplied each sample with identical temperature along the length of each tube. We let the samples all come to an equilibrium temperature while convecting in free air at 68° F. Hot water was supplied by a 5 gallon electric water heater set at 120° F. When the samples reached equilibrium with the air, the surface of the copper tubes was measured at 118° F.
Copper also has a low emissivity and the copper tubes were also painted flat black so the IR camera could show that all the tubes reached an equal temperature. Copper tubing was used instead of the PEX tubing normally used in radiant floors in order to minimize the temperature drop across the tube wall and accentuate the difference in heat transfer between the samples. When evaluating these data, it's important to bear in mind that free convection in 68 °F air represented the entire heating load on these samples. At equilibrium, the temperature of these samples is a balance of the rate at which the sample gains heat and the rate at which it loses heat. The actual heat flux in btu/hr from any of these samples is dependent on the ability of the sample to retain temperature under load. Any increased load as in any actual heating application, especially where the heat transfer plate is in direct contact with a lower temperature solid material would serve to decrease the the temperature values seen in these data. Only the Ultra Fin is intended for use as a freely convecting device. Any freely convecting device is dependent on a strong temperature difference to move the mass of the air between surfaces and will lag any direct contact device. The others are all intended for direct contact. With the orientation of the samples vertically as shown, heating water was circulated through the tubing at 120 °F. Jon's IR camera recorded a high temperature of 118.1° F at the exposed copper elbows. It also noted a low temperature of 67.7° F, which is reflective of the air temperature in the test room. It should be noted that the plane of the camera lens was most perpendicular to the samples at the far left while the samples at the far right were presented to the camera at a more oblique angle. Theoretically the oblique angle reduces the accuracy of those readings (likely tenths of a °F or less in this case). To a very small extent this skews the results, but in favor of the samples which demonstrated the poorest performance. To show each plate at its best, Jon evaluated the average temperature of each sample according to a "best average" based on the varying geometries of the different samples. Graphite Sheet - The graphite sheet - #1, measured 6" wide x .020" thick and clearly demonstrated the worst heating performance achieving an average temperature fully 32 °F less than the circulating water temperature. The graphite sheet is significantly oversize relative to the outer dimension of the copper tube, creating an air gap as large as .040". It can be seen in the photo below that it is not really possible to compensate for this oversize fit by altering its attachment to the substrate. If the PE support is compressed, air gaps open at the top of the tube; if it is pulled apart, air gaps open at the sides. Both the IR photograph and the natural photograph were taken with the sample natural to its over-sized form. Finally, it appears that heat received by the plate from the tube in the center is not being conducted to the edges, calling the conductivity of the graphite into question. From this we can conclude that even if the graphite sheet were somehow firmly fixed to the tube, the sheet would heat in the middle but not at the edges. Ultra Fin - The aluminum alloy "Ultra-Fin", sample #2, measured .015" thick and 5.5" wide. The Ultra-Fin product consists of two, 180° parts that are designed to be clipped or riveted together to surround the tube. In our experiment the two sides were fastened together with a piece of twisted copper wire. The left side of the sample was represented by a shorter piece of an older generation of the product. It should be noted that, compared with the graphite sheet and the sheet metal plate, the Ultra-Fin conformed closely to the copper tubing. Despite this the shortened plate on the back of the tube was observed to be in somewhat poorer contact with the copper tube. Possibly fastening the two halves of the Ultra-Fin together with rivets or the special clips provided by the manufacturer would result in better contact, especially of the back half. Chart showing maximum, minimum, and average relative plate temperatures as well as water temperature. It can be seen in the photos that the front half of the Ultra-Fin, (facing the camera), clearly gains heat from the tube and this results in a strong temperature rise in the center. Despite this, it does not appear much of this heat in the center is conducted to the edges. We can conclude from this that at .015", in free air, the Ultra-Fin is of insufficient thickness to carry as much heat from the center, directly below the tube, as it loses to the edges. The path length at the center directly below the tube is equal to the thickness of the Ultra-Fin, .015", where the path length from the plate at the outer edge of the tube to the edge of the Ultra-Fin is 2.25". Typical sheet metal "Omega" plate used in the test. This plate measures 4.75" wide x .015" thick. The diameter of the channel measures nominally .640"* leaving a maximum .0075" air gap around the tube. This generic plate is actually formed well and best represents the class. At the same time some attention to installation is required for it to hold the shape shown, especially on heating, where thermal distortion can alter critical tube/plate and plate substrate relationships. Omega Sheet Metal Plate - Sample #3 is a generic representative of a formed sheet metal plate. It measures 4.75" wide and .O15" thick. The inner diameter at the ends of the plate as measured with digital calipers is .0640", leaving an air gap of only .0075" between the aluminum plate and the .625" od copper tube. The tolerances with which such a thin plate can be formed are not that tight, however. At least one point can be seen in the IR photo where the air gap is considerably less and the tube is likely contacting the plate. The temperature measurements at this presumable point of contact resemble those of the Ultra-Fin, at the edge and the center of the plate. Both the sheet metal plate and the Ultra-Fin are formed of .015" thick aluminum alloy. It appears that even if the sheet metal plate were more firmly fixed to the the tube, it would gain heat in the center but is of insufficient thickness to conduct heat to the edges without a significant temperature drop. Close photo of ThermoFin U showing tight snap fit. Note that the copper tube has retained it's round shape after being snapped in the extrusion. 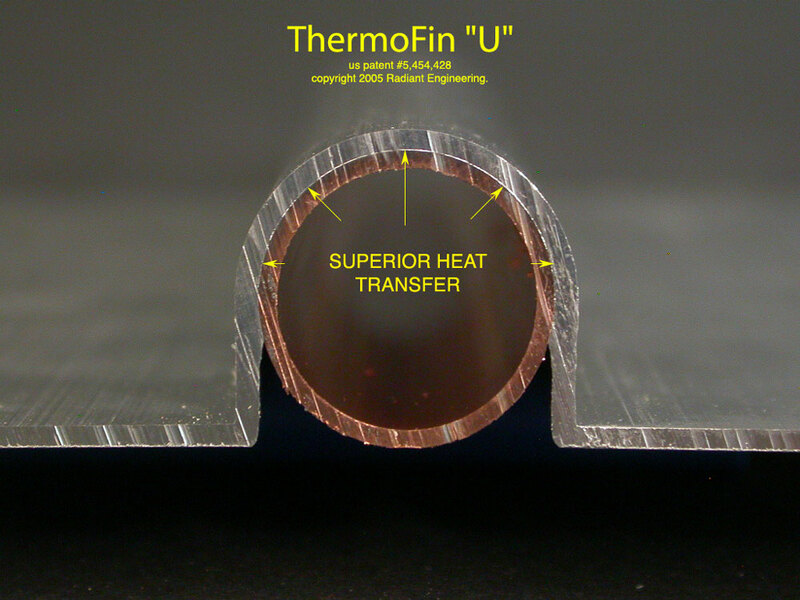 The ThermoFin U sample tested is 4" wide, .050" thick and extruded from 6063 T5 aluminum alloy. ThermoFin U -Sample #4 is Radiant Engineering's ThermoFin U. This is an extruded heat transfer plate which measures 4" wide and .050" thick. This plate takes a U configuration, preferred for some applications or particular installation techniques. We recommend this product for use in radiant walls, ceilings, and over the sub-floor applications. The infra-red photo speaks for itself. Even this product shows some small variation with which good contact is made with the radiant tubing. Here we think the variation is an experimental artifact actually caused by the painted copper tube where the paint is acting as an insulator. Copper tube shown snap fit into ThermoFin C. Note the copper tube retains it's round shape after being snapped into the extrusion. The ThermoFin C sample tested is 4" wide , .0625" thick and extruded from 6063-T5 alloy. 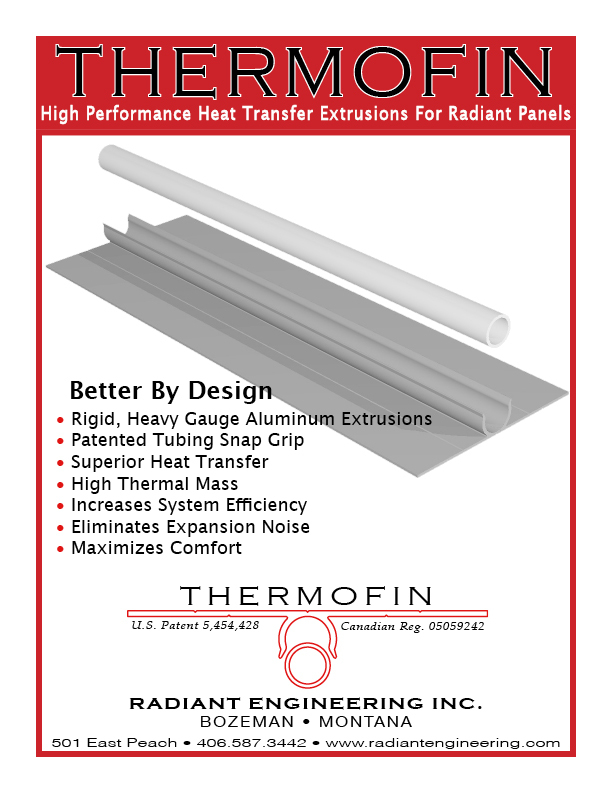 ThermoFin C - Sample #5 is Radiant Engineering's original ThermoFin C high performance heat transfer extrusion. This shape is 4" wide and .0625" (1/16" thick). The infra-red photograph speaks for itself. The infra-red camera can distinguish between the performance differences between the ThermoFin C and U shapes. This distinction between the two is due to the increased thickness of the extrusion and the rigidity with which the C shape grips the radiant tubing. This illustrates that both contact between the tube and the plate, the area of contact and the pressure with which the contact is made are all important factors in heat transfer. The relatively thick and tempered aluminum extrusions allow consistently precise manufacturing tolerances. In these photos it can be seen how the normally round copper tube retains it's cylindrical shape even as it is firmly gripped by the tubing. The carefully designed snap channel uniformly grips the heat transfer tubing along the entire length of the finished product. These extrusions are offered in 4' and 8' lengths. Compared with the other samples, both of the extruded aluminum shapes show differences in heat transfer performance that are clearly related to intentional design and clear specification. These results are easily predicted from elementary heat transfer theory. When interpreting these results, it is important to understand that heat transfer has not "increased" so much as resistance to heat transfer has been reduced. As resistance is reduced, more heat can be moved at lower water temperatures. In this simple examination, convecting freely in room temperature air, none of the samples were under the heating load they would experience in any panel heating application. The temperature loss across the width of all these plates will increase under load. Heat that is not lost from the water stream in the tubing to the plate, will return to the heat source. This experiment is simply intended to explore and demonstrate the relative differences in heat transfer between several different heat transfer plate designs. Heat flux is a term used to describe the rate at which heat can be moved through a system. The demonstration does not address heat flux except to note that flux will be higher with the better performing samples. Future experiments will address how the rate of heat transfer through different samples changes with load and with water temperature. For more information on the reasoning behind the ThermoFin design see, Why ThermoFin? Posted in design, engineering, heating, radiant, renewable and tagged with radiant heating, metal transfer plates, comparison, infrared study, aluminum plates, staple up, omega plate, climate trak, joist trak, viega, uponor, thermofin, thinfin, proradiant, graphite plate, heat fins, tubing fins, tubing plates. March 20, 2013 by Dale Pickard. The point of design and engineering is to provide function while preventing failure. The provision of thermal comfort is one of the rudiment parts of what we know as shelter. The provision of shelter is part of what has made civilization possible. Posted in engineering, design and tagged with radiant heating, design, engineering, custom radiant heating systems. January 11, 2013 by Dale Pickard. Tagged with nature, timelapse, stars, space. April 4, 2012 by Dale Pickard.